This has to be quick. Sorry for any typos or errors, but I’m packing, medicating, and generally running about today and this could not wait. I got a very nice letter from Bob Gaskins yesterday. If you don’t recognize the name, here’s a clue: He’s the guy who “invented PowerPoint”. Quotes are there because 1) there were a couple of other guys involved in the birthing process and 2) I think the product gets reinvented with every new release. However it was Bob who built the vision for the product and made it happen. 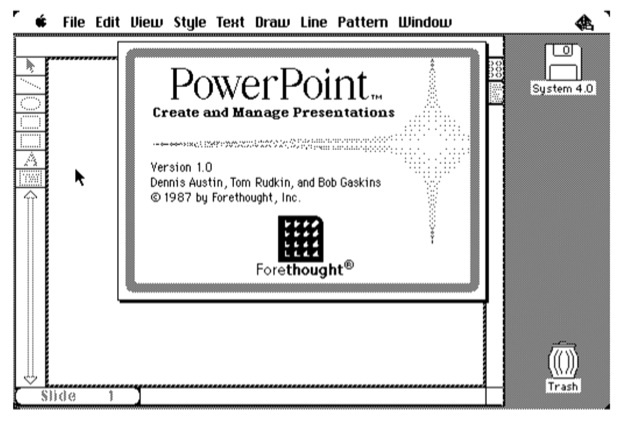 Bob’s written a new book, called Sweating Bullets: Notes about Inventing PowerPoint. He wrote it specifically to celebrate the 25th anniversary of PowerPoint. And I’m reading it right now (along with preparing for two separate conventions and five panels I’m on this weekend, I did mention running about crazily, right?). So I’ll do more of a review later, but wanted to get this out to you, dear reader, because you’re special to me. It’s kinda like looking at cave drawings…. This entry was posted in Books, Business, Deals, Design, Geeking around, History, Media, Organizations, Personal, PowerPoint, Presentations, Software, Technology, Thoughts, Writing. Bookmark the permalink. Ric B is near and dear to my heart. Great book for us PowerPoint Geeks — and the rest of the world!